There was almost an inevitability about this album… after all, Bowling For Soup frontman Jaret Reddick and The Dollyrots singer Kelly Ogden have been an “item”, in purely musical terms, for more than a decade now, with the latter band having been BFS’s go-to support band of choice for more gigs and tours than either probably care to count. And, of course, it is not the first time that the two band leaders have collaborated: live, they usually play a song together, they released an album called ‘One Big Happy’, and a subsequent 7” on which they covered each other’s songs, and most recently recorded a duet called ‘Love Ya Love Ya Love Ya’. And it was after performing the latter at London’s infamous Roundhouse during BFS’s 2016 UK tour that the pair decided to lay down an album of original duets… now, three years later, we have the result. And a very pleasant outcome it is too, in the shape of 14 slices of beautiful power pop, with elements of country and, of course, pop punk just to keep things interesting. It is an album which exudes, and captures, the energy and naivete of a bygone, much more innocent age, but with darker undertones that only two musicians of such experience can bring to bear. The album kicks off with the first two singles, ‘Here We Go’ and ‘Doin’ Alright’, both of which featured in the ÜR Singles Club, in February and March respectively: the former is a fast ‘n’ furious slice of classic pop punk action which would happily sit in the main body of work by the likes of BFS, or any of their contemporaries (or successors), in its own right – and probably would be a massive hit if it was, while the latter is very much in country territory; at the time of release, I said to “think Dolly Parton duetting with Louden Wainwright and you’re sort of in the right territory”, and that really sums it up. ‘Something I’m Not’ is another gloriously manic slice of inane power punk, lyrically swiping at the penchant for the music business to chase the latest fads while music very much the successor to the likes of Blink 182’s ‘All The Small Things’, especially in its hook. Now, I’m not going to go through the album track-by-track, as that often becomes an exercise in needless repetition, but the first three or four songs set the scene for the rest of what is to come: bright and breezy melodies, yet possessing a dark reflection, catchier-than-ebola hooks and melodies, tongue-in-cheek lyrics delivered with a pair of ironic smiles, an homage to an era when pop songs were written to entertain, while also delivering serious messages which occasionally punch through the initial inanity of the delivery. If Johnny Cash were trying to break through in the 21st century, this is probably something along the lines of what he and June Carter would have produced together. An enjoyable, fun-filled and highly enjoyable 40-minute slice of pop played the way it should be, with no airs or graces, just a genuine desire to bring smiles to the faces of those listening to it and get their heads nodding and feet tapping in the process. 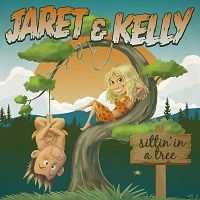 ‘Sittin’ In A Tree’ is out now. You can get your copy HERE. Bowling For Soup play The Telegraph in Belfast on Wednesday 24 April and the Academy in Dublin on Thursday 25 April.